Capital Metro is among eight transit agencies that were awarded Operation Lifesaver (OLI) rail safety project grants. This grant is part of Capital Metro’s ongoing commitment to safety and will enable our agency to further our efforts in keeping safety our top priority. What are our plans for the grant? We’ll target middle school students, by blitzing them with educational materials, a youth-produced video and a 15-month outreach campaign involving peer mentors and lesson plans for educators, a new website and school outreach events. As a public transit agency, we know you want to keep up with what’s going on at Capital Metro. From service changes to our budget–we want to keep you in the know. Recently, we worked on our new budget. On Monday, September 24, 2012, the Capital Metro board of directors adopted a $274.5 million project and operating budget for Fiscal Y2013, which takes effect Oct. 1, 2012. The budget was approved in a unanimous vote, which went into effect this month. In our continued efforts in maintaining financial transparency online, we updated our website with the latest budget information available. View all the in’s-and-out’s of the new budget at capmetro.org/budget2013 or download the full version here. The FY2013 budget was balanced without reducing service levels or increasing fares, and allows us to continue building our reserves, which will keep us strong and financially stable in the years to come. $16.2 million to fund interlocal agreements and other expenses. As a result of both board and public feedback, $250,000 in additional funding was added to the Basic Transportation Needs Fund, which provides financial support to organizations such as One Voice Central Texas to assist low-income transit-dependent riders, along with an additional $482,235 for the Bus Stop Accessibility Improvement Project (bringing the total commitment for the project to $2,478,130). “We’ve made much progress during the last few years to strengthen our financial position and enhance our business practices. We’ve changed our labor structure, made bus service more efficient and adopted rigorous financial policies, all in an effort to improve the way we do business,” said Capital Metro President/CEO Linda Watson. More federal grant funds for Central Texas! Great news! Last night, the U.S. House of Representatives passed their Transportation, Housing and Urban Development (THUD) appropriations bill for FY2011 and it included $24.23 million for Capital MetroRapid! Whatever Happened to That Web Update? Our Share of "the Stim"
We recently heard from the feds that Capital Metro may receive about $26.1 million from the economic stimulus plan (or if you prefer the long name, the American Recovery and Reinvestment Act of 2009). Our initial proposed project list includes many possibilities, all of which would be key components of a regional transportation system that this area needs to remain economically competitive and to retain and attract businesses. 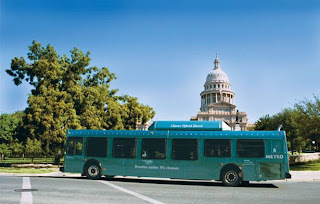 –Bus and paratransit fleet replacement and expansion: More than half of Capital Metro’s fleet will require replacement over the next several years. –MetroRail Red Line Expansion: A likely first step would be to add some additional track siding which would allow increased service. –Construction of new park & ride facilities: Possible locations for new P&Rs include South IH-35 and the city of Manor. –Expansion of Intelligent Transportation System (ITS) Technologies: Expanding the ITS system would allow us to provide real-time information for onboard audio and visual announcements to notify customers of upcoming stops. This would also result in more predictable service and improved operating efficiency. –Upgrade of bus stop signage: Improved bus stop signage would provide information more effectively. –Rail with trails: Over the years the community encouraged Capital Metro to plan for bike and pedestrian trails along our rail line. Capital Metro is working diligently to determine the best use of this stimulus funding to provide maximum benefit for the community. We should have more detail in the coming weeks. Cheers to the first day of the State’s 81st legislative session that began today, because Capital Metro’s got a lot on our plate! We’re simply trying to keep up with ways to provide the modern-day necessity of transit in an urban area. What’s on our wish list, you ask? A lot. OK, it’s not that much but it’s a fair amount so I’ll just write about some of our more interesting initiatives. – Civilian fare enforcement abilities on MetroRail. – Enhanced security abilities throughout our service area. – The ability for buses to drive on highway shoulders during massive congestion. – New community funding sources for transit. And while not part of the legislative program that our Board asked us to advance, I’ll touch upon one more issue that could come up in the session: the referendum required of our agency in order to build, or even operate, passenger rail. Our Red Line between Leander and Austin opens this March. Seems pretty standard, or at least not unusual, for a transit agency to operate passenger rail—even in Texas—but we still need some changes to state law so that we can more effectively operate a regional rail system. Like Dallas and Houston for example, we won’t have barriers or turnstiles to board MetroRail so we’re looking for the ability, also like that of Dallas and Houston, to hire civilian employees who can enforce fares by requesting proof of payment and issuing tickets if necessary. We also need to make sure that the peace officers with whom we contract to serve as some of our security (currently APD) are able to use their law enforcement abilities if there is a crime occurring on Cap Metro property outside of their jurisdiction so this too is on our agenda. We’re also working on a couple of efforts from last session and I’m especially optimistic about one of them this time: the ability for our buses to drive on highway shoulders when roadways become congested, of course only where safe and if approved by TxDOT. We’re very fortunate to work with Senator Jeff Wentworth and his hardworking staff again. They were able to get this passed in the Senate last time but unfortunately we just ran out of time in the House. (New House Speaker Joe Straus led on that side of the Legislature.) This practice is used all over America and in effect creates extra highway capacity, but only for buses, for very little money–an easy way for public transportation to achieve a travel-time advantage. Per TxDOT, the estimated cost per mile is only $2,000 for sections that are already structurally sound. (Compare that to their estimate of $8 million per mile for a new lane on an existing highway.) Other good news is that this past December, the House Transportation Committee already recommended this legislation. There are two other big issues that I also want to mention. One item is part of our agency’s legislative agenda and the other isn’t, but was recommended as part of a recent CAMPO study of our agency. The first item deals with, frankly, money. Capital Metro doesn’t have enough funds to create a truly regional transit system and, further, we are limited in our ability to do this. As a result of how communities are allowed to join Capital Metro under State law, our current service area does not reflect the residency and work patterns of Central Texas. If you are geeky enough to read this Capital Metro blog, you probably know that communities like Round Rock, Cedar Park, and Pflugerville are not in our service area. To join Capital Metro, an entity must dedicate a penny of their community’s sales tax to our agency’s funding. This is what Austin, Leander, Manor, Lago Vista, Precinct 2 of Travis County, and 5 more communities do. People all over Travis and Williamson Counties want and need public transit. Remember when gas was $4 a gallon and our ridership went through the roof? To me, one Statesman story said it all. If I recall correctly, something like four of the five people in the photos on our Express buses did not live in our service area. And in 2030, more than half of our metro area population will live outside of the Capital Metro service area. Clearly, Capital Metro’s service area needs to be larger. But the problem is that these communities, which so desperately need transit, have committed all of the local sales tax the State allows them to their community’s other priorities like economic development, property tax relief, or roadways. So we have to think of other ways that people can pay for transit other than sales tax. One of the ideas that is being kicked around in this region, and all over other major metro areas in the state, has emanated from North Central Texas. For the past two sessions, prompted by a desire to expand their regional rail system, the North Central Texas area has asked the Legislature for permission to let communities‘bust’ the local sales tax cap but only for transit. The Legislature wasn’t quite comfortable with this and suggested they come back with other creative suggestions that could be applied statewide. While there are still a number of details to be worked out, they are now proposing that local communities be allowed to levy a limited number of taxes and fees, from a Legislature-approved list of options, for local transportation projects. These monies could only be raised if approved by the voters. Capital Metro’s also supportive of this idea but we’re trying to figure out the best way to address issues such as governance and equity—some very tough issues to tackle but definitely worth tackling. Lastly, I want to mention the State’s requirement that our agency secure voter approval in order to build or operate passenger rail, even if we do so within existing funds, like we did for the Red Line. Removal of the requirement isn’t part of our Capital Metro’s legislative program but the study that CAMPO just wrapped up of our agency recommended that this be removed. No other transit agency in the state has this requirement and, to our knowledge, no other agency in the country does either. While passenger rail is a fairly typical function of many urban mass transit agencies, most agencies still have to go to referendum to have the actual funding approved. That’s totally understandable and realistically, this would be the same for our area. I don’t know of any way that more passenger rail could be built in Central Texas without going to the voters for funding approval. Even though Capital Metro has been this region’s public transportation provider for over 20 years, this requirement can unfortunately cause other entities to be hesitant to work with us if they already have to go to referendum once for funding. Capital Metro’s got a lot to chew off, and there’s still a little bit more, but I won’t continue droning on. No one can guess what will happen at the Legislature but I’m optimistic that they’ll see fit to grant us these abilities so that we can continue improving upon the service that we provide, and that Central Texans need. Traffic is a mess and there is so much support for public transportation right now. It’s an opportune time for the State to make these changes. My little slogan is that we simply need 21st century tools to do a 21st century job. Here’s hoping for a *happy* happy hour in 140 days.